One of the hardest things when working with BLE is simply getting started. Whether it’s the setup of the IDE, the configuration of the project, or the implementation the BLE application. I’ve been there… I’ve felt lost, not knowing where and how to start… This is especially true since I was trying to learn the technology itself (BLE) in addition to learning an SDK, platform, and IDE all at once! It just felt overwhelming and way too many things to learn at one time. There’s nothing wrong with the other platforms and chipsets, but it also helps if you stick to one platform that you feel comfortable with (at least for a given period of time, especially in the beginning of your journey in learning a technology). To guide you through setting up and developing the most basic BLE peripheral application: a smart BLE lightbulb application you can control from your smartphone. In the previous blog post (The complete cross-platform nRF development tutorial), we went over how to set up the IDE of choice for developing nRF52 applications (Segger Embedded Studio) on any platform (macOS, Windows, Linux). In this post, we’ll focus on developing the BLE peripheral application, building it, debugging it, and finally testing it from a mobile phone application. We’re going to build a very simple BLE lightbulb application that allows you to turn ON/OFF an LED on the nRF52840 development kit. The Peripheral application will also expose the battery level of a coin-cell battery installed in the development kit. The peripheral will notify the Central (mobile phone application in our case) when the battery level gets updated. Keeping the example dead-simple is extremely important. You can always customize and expand your application once you’ve learned the basics. But if you start with a complex application, you can get lost, and ultimately become frustrated before you get something working. …which is why we’re keeping it simple in this application! To follow along with this example, you’ll need to know the basics of BLE. It does not require you to have in-depth knowledge of BLE. In fact, I recommend you do not spend too much time going through the theory and skip right into developing a BLE application and getting your hands dirty once you’ve gone through learning the basics. 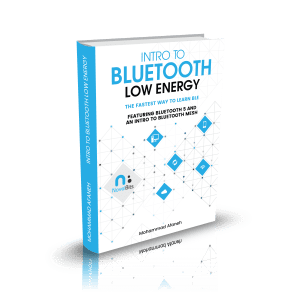 Alternatively, you can sign up at the following link: FREE 7-day crash course on Bluetooth Low Energy (BLE). So, what hardware & software do I need? We’ve already covered how to install Segger Embedded Studio (the FREE License IDE used for nRF5x development) in a previous post. Here, we’ll focus on the steps that follow the installation. Next, let’s download the latest nRF5 SDK (version 15.0.0) from Nordic’s website. Once you have it downloaded, place it in a new folder. To make things easier, we’ll put it in a folder alongside the application we’ll be developing. In my setup, I’ll be creating a new folder named “BLE Projects” which contains the SDK folder as well as another folder for the application. Now, it’s time for a little clean-up! Move the SES Solution file (ble_app_template_pca10056_s140.emProject) along with the flash_placement.xml file to the root application folder (both of these files are located under pca10056/s140/ses). You can also move the *.jlink and *.emSession files, but those are not necessary as SES will re-create them once you open the Solution. Now that we’ve got the folder structure set up, we need to update the SES project file to reflect these changes (this is something we’ll only have to do once). First, rename the file “ble_app_template_pca10056_s140.emProject” to “”ble_lightbulb_pca10056_s140.emProject“. Next, open the file in your text editor of choice. Replace any references to the SDK (since we copied the application folder outside the SDK). Next, open the Solution (*.emProject file) in SES. * @param[in] p_evt Peer Manager event. /* Often, when securing fails, it shouldn't be restarted, for security reasons. * Other times, it can be restarted directly. * Sometimes it can be restarted, but only after changing some Security Parameters. * Sometimes, it cannot be restarted until the link is disconnected and reconnected. * Sometimes it is impossible, to secure the link, or the peer device does not support it. // Reject pairing request from an already bonded peer. // Run garbage collection on the flash. // This can happen when the local DB has changed. /**@brief Function for the Peer Manager initialization. /**@brief Clear bond information from persistent storage. * @param[out] p_erase_bonds Will be true if the clear bonding button was pressed to wake the application up. We need to add a write handler for the LED settings in main.c. This function will get used for the custom service and characteristic we’ll be implementing in our application. * @param[in] p_led_service Instance of LED Service to which the write applies. Let’s talk about the design of our application, and what elements we need to add to implement our smart BLE-controlled lightbulb. To be able to control the LED on the development kit from a BLE client (a smartphone application in our case), we’ll need to implement a custom service and characteristic for the LED. We need to create one service. We’ll call it led_service. In that service, we’ll add a single characteristic dedicated to LED 2 on our development kit (LED 1 will be used to indicate the state of the BLE peripheral: Advertising or Connected). Let’s call this characteristic: led_2_char. For each (service and characteristic), we’ll need to choose a custom UUID (to learn more about custom/vendor-specific UUIDs and how to pick them, refer to this blog post (Creating custom UUIDs). Instead of including the implementation of the LED service in the main.c file, we’ll be including them in a separate folder and files. Let’s create two files: led_service.h & led_service.c. We’ll be placing these in a separate folder named Services. Here are the contents of the source files. We’ll list the full source code first, and then go through the content explaining it. /**@brief Macro for defining a ble_led_service instance. * @param _name Name of the instance. // Forward declaration of the custom_service_t type. /**@brief Function for initializing the LED Service. * be used to identify this particular service instance. * @return NRF_SUCCESS on successful initialization of service, otherwise an error code. /**@brief Function for handling the application's BLE stack events. * @details This function handles all events from the BLE stack that are of interest to the LED Service. * @param[in] p_context LED Service structure. * @param[in] p_led_service LED service structure. * @param[in] p_bas LED service structure. /**@brief Function for adding the LED 2 characteristic. In addition to the custom Service and Characteristic, we’ll be using the Bluetooth SIG defined Battery Service, which includes a Battery Level Characteristic. (No need to create our own custom since we can reuse the SIG-defined Service). // <o> NRF_SDH_BLE_VS_UUID_COUNT - The number of vendor-specific UUIDs. Now that we have the Battery Service enabled, we need to implement the actual reading of the battery voltage level from the coin-cell battery installed in the development kit. The good thing is we don’t have to implement this from scratch. In fact, one of the components within the nRF5 SDK provides exactly what we need! The component we’ll be borrowing the code from is the Eddystone component (used for a beacon standard called Eddystone). We’ll copy these files into our project folder “ble_lightbulb” under a newly created folder named Battery Level. Now, you’ll need to add this folder to the Project in SES. Follow the same steps we did before with the LED Service files (creating a folder named Battery Level, but then using the Add Existing File option instead of creating a new one). /**@brief Function for initializing the battery voltage module. /**@brief Function for reading the battery voltage. * @param[out] p_vbatt Pointer to the battery voltage value. #define ADC_REF_VOLTAGE_IN_MILLIVOLTS 600 //!&lt; Reference voltage (in milli volts) used by ADC while doing conversion. #define DIODE_FWD_VOLT_DROP_MILLIVOLTS 270 //!&lt; Typical forward voltage drop of the diode (Part no: SD103ATW-7-F) that is connected in series with the voltage supply. This is the voltage drop when the forward current is 1mA. Source: Data sheet of 'SURFACE MOUNT SCHOTTKY BARRIER DIODE ARRAY' available at www.diodes.com. #define ADC_RES_10BIT 1024 //!&lt; Maximum digital value for 10-bit ADC conversion. #define ADC_PRE_SCALING_COMPENSATION 6 //!&lt; The ADC is configured to use VDD with 1/3 prescaling as input. And hence the result of conversion is to be multiplied by 3 to get the actual value of the battery voltage. static nrf_saadc_value_t adc_buf; //!&lt; Buffer used for storing ADC value. static uint16_t m_batt_lvl_in_milli_volts; //!&lt; Current battery level. /**@brief Function handling events from 'nrf_drv_saadc.c'. * @param[in] p_evt SAADC event. To be able to read the battery level, we have to set up a timer to trigger the reading of the battery voltage in the application’s main.c file. /**@brief Function for handling the Battery measurement timer timeout. * @details This function will be called each time the battery level measurement timer expires. * app_start_timer() call to the timeout handler. battery_level = battery_level_in_percent(vbatt); //Transform the millivolts value into battery level percent. * @details Initializes the timer module. This creates and starts application timers. /**@brief Function for starting application timers. Finally, we need to initialize the LED and Battery Services in the main file (main.c). // 2. Initialize Battery Service. // Here the sec level for the Battery Service can be changed/increased. The function initializes both Services as well as defines the permissions of the Battery Service and Battery Level Characteristic. Before we build and flash our program to the development kit (nRF52840), we want to enable logging first so we can better follow the state of events and the state of our application. Open sdk_config.h and make sure the following macros are set to the correct debug level (4). This level will enable all debug statements in the debug terminal within SES when you run your application. Now, we can flash the application to the development kit. Our next and final step is to test our application and make sure it’s working fine. For this, we will use a mobile phone app that acts as a BLE Central. For this example, we’ll be using an app called LightBlue (available for iOS and Android). To be notified when future blog posts are published here on the Novel Bits blog, be sure to enter your email address in the form below! Nice work, but I think you need to double check your code samples: I found several missing definitions and the source for the led_service.c file does not match the sections you split out for explanations (e.g. check for LED2 vs LED1), making me wonder if you used the wrong versions at some point. Likewise, you missed documenting a few steps in editing the project file,like making sure the current directory is in the include path. That said, I really appreciate an extensive example. Thanks. I updated the listed source code to match the downloadable code — I had at some point fixed some issues (such as the LED1 vs. LED2 mismatch) in the source code but forgot to update the post to include the changes. I don’t see any missing definitions locally on my computer, can you tell me which ones you found missing so I could include them? Also, I didn’t have to do anything with the include path, can you list the changes you had to make to the project file? 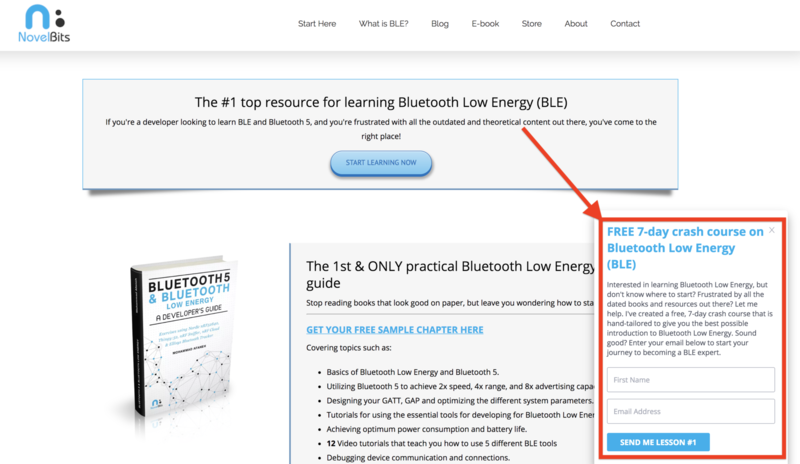 hi Mohammad, I was excited to find your article and step-by-step tutorial as I am new to Nordic BLE. Did you check if the sdk_config.h file exists in the main lightbulb folder? What SDK version are you using? Hi Mohammad, Thank you for your quick response. 2. Yes sdk_config.h file exists under the main lightbulb folder. .f. run the project file and got errors. I tried it again and still got same errors. You can also try changing it to use the full absolute path instead of the relative one. Also, make sure the file is included in the Project in SES. I added the following to the list of directories and the compiler was able to find the sdk_config.h file and sucessfully compile. So, basically just remove the trailing “/” after the “.”. For some reason, Windows does not like it. What you mentioned in your email is not possible because my project is exact copy of yours. So you would have see these issues before I. Anyway.. I was able to move forward and compile your project without errors. a. create a sub-directory call “config” same level as my main.c file. b. move the sdk_config.h file in the new config directory. c. add “./config” in the emProject file. I have tried but I don’t know why sdk_config.h needs to be under the config directory. it does not work without it, even after you change all the paths (2 path). Even if you hard code the paths. I am okay with a config directory infact I prefer it. so i call this issue resolved. and let you know, most probably some additional path issues in my environment. Do you know – when I installed the Sagger Embedded studio, do I need to set some paths in window 10? So, basically just remove the trailer “/” after the “.”. For some reason, Windows does not like it. Thanks for the code. I tried a few things extra in this exercise like adding LED3 and LED4 into the code. I duplicated the format to initiate the LED2 for LED3 and LED4. The code compiled however The service did not come up on the app. Is there something I did wrong? I literally just copied the format for LED 3 and LED 4. Since Nordic published the new version of SDK (15.2.0), I find a lot of problem while trying to compile the code downloaded from your link. Mainly two problems : 1) directory path error, which is may caused by the path changing of the SDK; 2) Function and structure elements name error, which is also may caused by the declaration/definition differences between the new version SDK and the old one you used. I cannot attach the bug logout here because the number of errors is too too many. Maybe the project can work before, but I really spend a lot of time on fixing the bugs, and finally give up because I can’t quiet understand what the code try to do whiling using the SDK especially with so many directory path and definition errors . I’m a new guy for using the nRF52840 kit, and really thanks for your instruction of how to start a simple BLE application. If convenient, please update the source code with new version SDK (I cannot find the old version 15.0.0 from the website), or combine the code and the SDK used for the code in one file. Thanks a lot. I have project code ported to the current version of Nordic SDK (15.2.0). I can share it on my Github account. Thanks, Robert! That would be great! Thanks for sharing the code, Robert!